One of the most anticipated events is happening this Saturday in Vegas, being the much hyped Mayweather vs. McGregor match. While you weren't quite able to secure tickets for the weekend, you can still watch in style and still catch your Sunday morning appointments. We've dug up some of the best viewing parties happening in NYC, to make sure you don't end up overpaying in a bad location. You'll want to remember the match is on the west coast and will start Aug. 26 at 9 p.m. So unless you're willing to host yourself here are some of our top spots to watch the match. For those who are looking for a once in a lifestime experience Sushi by Bou, Chef Takeshi Sato will host a special one-night-only omakase experience on Saturday, August 26th beginning at 9pm at Sushi by Bou beneath The Sanctuary Hotel. The pro-boxer turned acclaimed sushi chef will showcase his knife skills during the Floyd Mayweather Jr. vs. Conor McGregor fight. Sixteen diners will get to partake in a $250 per person all-inclusive experience, including an intimate screening of the fight complete with an unforgettable 90-minute dinner and drinks. The dining experience will reflect the veteran sushi chef’s philosophy and spin on the NYC-meets-Tokyo omakase and will feature 14-16 pieces, along with a hand roll, of the best fish selections from the Tsujiki market. After the fight an open sake, beer and a specialty cocktail bar will be available from 9pm-midnight. Located at The Sanctuary Hotel (132 W. 47th Street. To make a reservation, text 917-348-5737. The Ainsworth will be showing the fight in both Chelsea and Midtown locations. No RSVP required, door will be first come first in with door cover of $40 per person which will include the first drink on the house. The menu includes a selection of signature passed and stationary American fare, as well as handcrafted cocktails. If you are unfamiliar, The Ainsworth is famous for theirMac & Cheese Burger (panko crusted mac & cheese patty, beef patty, mac & cheese, sesame bun)! Save money while dining out by choosing one of these BYOB restaurants in NYC. You’ll love the freedom and cost-effectiveness of bringing your own beverages. With 80 HD TV's, more than three dozen beers, and a completely open-air space, Bowery Beer Garden (93 Bowery) is the best place to take advantage to this Summer fight. General Admission entry is $40 and entry fee for guests with a table reservation is just $30. For those watching with a crew, treat yourselves to a Silver Package (a bottle of premium liquor for $300 for up to 4 people) or splurge on Platinum Package (two bottles of premium liquor and Prosecco for $650 for up to 10 people). Fight aside, everyone wins with $30 Beer Buckets, the $10 specialty Knock-Out Cocktail, $35 one-hour open bar, and a $49.99 Sampler Menus that serve up Crispy Fried Chicken Wings, assorted Bowery Sliders and Mac & Cheese Bites. 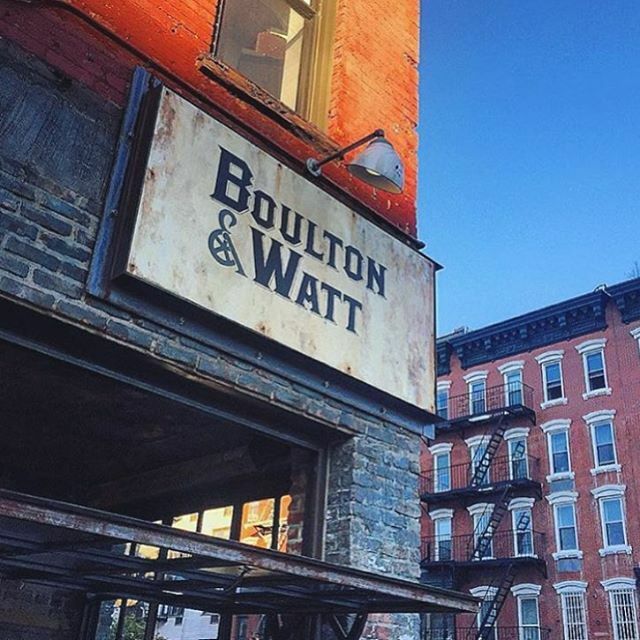 If you’re more interested in a convenient excuse to go out for delicious drinks and food, head to Boulton & Watt (5 Avenue A) where the fight will be shown for just $10 for pre-reservations or $15 at the door. Pull up a barstool or grab a table in front of one of their 7 widescreen TV’s while you and your friends bite into Crispy Chicken Sliders, Mahi Mahi Fish Tacos or perhaps their classic Mac & Cheese with bacon and wild mushrooms. They’ll also have the homemade Picklebacks lined up for just $7. Fight fan or not, whiskey and pickle juice is a one two punch everyone can get behind! Fight Night at Professor Thom's (219 2nd Ave) can be as low key or revved up as you please. For their upstairs VIP party you can roll with the punches with bottomless nachos and an open bar (including well drinks, draft beer and house wines) from 9pm till the end of the fight. Tickets are $75. Otherwise you can join the bar scene and view the fight downstairs for just $20 general admission at the door.